I love maths, puzzles and bright colours. 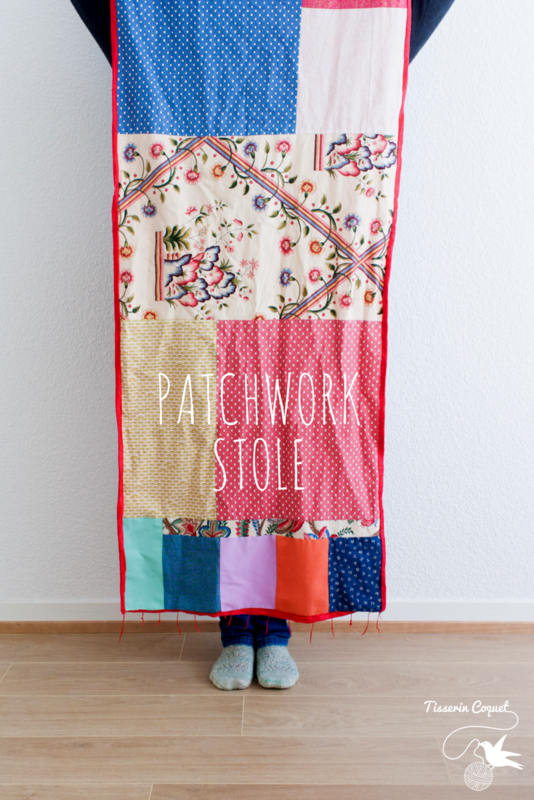 When I discovered that patchwork works like a fabric puzzle with big straight pieces, it’s not a surprise that I fell in love with it immediately! The downside of quilting is that you must have your sewing machine ready and some space to cut and press all of your fabrics. Knitting instead doesn’t require much space, and most of the time you can tuck your WIP in your bag. 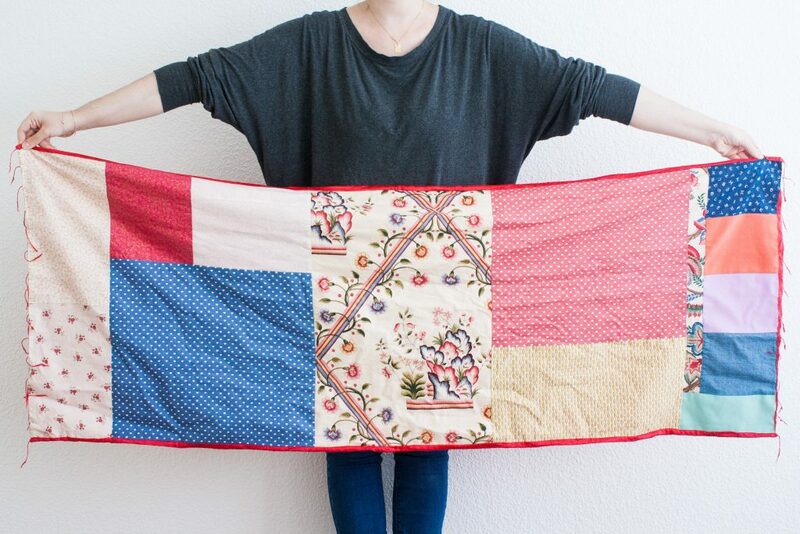 That’s why you don’t see that much quilting on this blog! Back in June, the sewing bug hit me hard and I HAD TO do something about it. I was looking for a quick 1-day easy project and started digging in my (small) fabric stash. One of my quilting goddesses is Rachel Hauser from Stitched in color. I discovered her blog a few years back and I easily admit that I’m hooked. I love her way to choose, play and work with fabrics. I decided to follow the same kind of approach when I started my own project. The main fabric was the first one I choose and I used it as a ground base to build my fabric choice. It has a cream background and different shades of blues, greens, pinks, and even a little bit of orange. Overall, it has a perfect autumn feel and allows a large spectrum of colours to play with. I only finalised my selection when I finally settled down on the backing: a used silk red stole which had almost the perfect size. I turned it into a guide to get a unified vibe through the fabrics and to find the best fabric placement. I kept the piecing really simple with only straight lines. I felt like the fabric should be the real stars here. 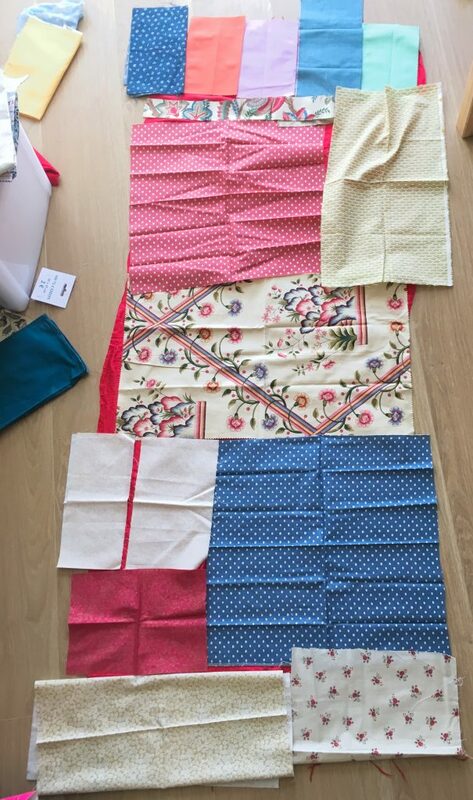 I’ve carried some of these fabrics along with me for a very long time, waiting for the perfect project to sew them. Well, it’s definitively not perfect but I love it anyway! I finished it with a simple double folded hand-stitched hem on either long side and secured the damaged short sides with a blanket stitch. After a quick wash and press, it revealed an even more beautiful drape as I expected! I’m wearing my Area of Effect socks, knitted in (Vi)laines Tordues MCN, col. Larking about in the meadows. Join the Tisserin Brood to get pre-release Sneak-Peeks spots (a.k.a. test-knitting - see the rules here), extra chance in giveaways and surprise exclusive content! I'll never send you spam nor share this information with third-parties. Unsubscribe at any time. Tisserin Coquet Knitting goods: stitch markers, project bags, etc.